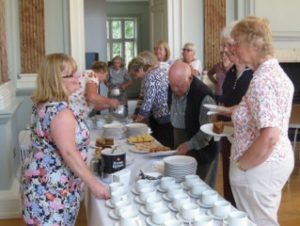 The monthly welcoming social group “In the Ballroom” has proved extremely popular and will continue throughout 2019. So get your diary out. It will be on the second Wednesday of each month (except in January which will be the second Thursday). Easy to remember! 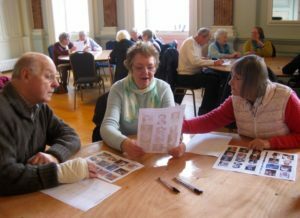 These afternoon gatherings are held from 2pm – 4pm in the Jury Street Court House ballroom, and feature a talk or an activity and usually a fun quiz; then tea, coffee and a selection of cakes served by Unlocking Warwick volunteers. There’s plenty of time to chat and make new friends. Entry is just £2. There’s no need to book. Just drop in! Here’s the line-up of activities for 2019. January 10th: A New Year Lucky Dip afternoon of games and activities with a topical quiz. February 13th: An illustrated talk by Ann O’Flanagan about the famous Wallace Art Collection and its connection with Warwickshire. March 13th: If Walls Could Talk. Local historian Trevor Langley tells stories from Warwick’s past – the good, the bad and the strange. April 10th: A talk about the History of Guy’s Cliffe Walled Garden and the continuing restoration work. May 8th: Canal Talk. Roger Butler presents the history and heritage of our waterways. June 12th: A summertime Afternoon Tea with a dramatic reconstruction of a meeting of The Warwick Health Board in the mid 19th Century. July 10th: Art Deco USA. Paula Fletcher gives an illustrated talk about the history of the colourful Art Deco buildings in Miami Beach, Florida. August 14th: The ever popular Antiques Roadshow with Steve Bruce. Bring small items for him to evaluate. September 11th: Beetle Drive, Quiz and Games. Join the Unlocking Warwick team for an afternoon of fun and laughter. October 9th: The Cadbury Story. Alan Thornton talks about the famed Birmingham chocolate family with a 1950s film about why George Cadbury moved to Bourneville. November 13th: Warwick Then and Now. A talk about Warwick’s oldest buildings, and how they have been adapted for modern life. December 12th: Christmas Carols. Our traditional seasonal get-together. For details and any changes, keep your eye on the Events pages on this website, or our ‘What’s On in Warwick’. In the Ballroom is brought to you by Unlocking Warwick, the Court House volunteer group, on behalf of the Town Council. It is supported by the Big Lottery ‘Awards for All’ and The King Henry VIII Endowed Trust.